Along the Railroad Corridor, two Bren gunners of the Royal Welsh Fusiliers maintain a trail block against a possible counter-attack by the Japanese. WITH THE 36TH DIVISION, NORTH BURMA - The field knows them as Festing's Killers, but the girls call them Burma's Blue-Eyed Boys. They hail from the Scottish Highlands, industrial Lancashire, from the gently rolling hills of Sussex and the green valleys of merry Wales. 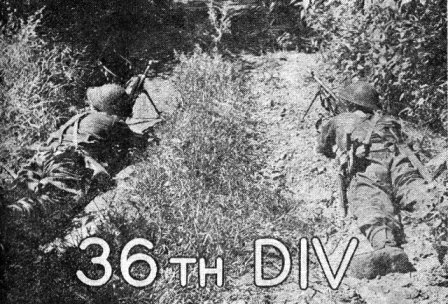 The ferocious 36th Division is one of the most pugnacious units among Lt. Gen. Dan I. Sultan's Burma troops. We meet them in the Katha Railway Corridor, a mountain-flanked narrow strip of land stretching from Mogaung to Katha, the important Irrawaddy junction and immediate objective of the present drive. The front, since this was written, has probably moved on with the steady-advancing division. The Killers must have torn down their tents of parachute silk, thrown them away and replaced them with new ones dropped with fresh supplies and ammunition by the Troop Carrier and Combat Cargo C-47's which follow on the heels of the advance. I marched with the division along the Road to Mandalay through a desolate countryside which was once populous and gay. Now there are only empty bashas, vegetable gardens turning into jungle, whining, hungry dogs in deserted backyards, shattered pagodas with gilded idols half buried in the ground, the stench of rotting Japs carried with every breeze, torn railway tracks, locomotives in riverbeds and, in the distance, the jungle-clad mountains where the frightened villagers wait in hiding for better days. In this sad memento mori one often hears the Killers' favorite marching song: In Mobile, in Mobile . . . The Eagles they fly high . . . In Mobile the Eagles they fly high . . . They ... in your eye . . . In Mobile. The Killers are not as gay as their snappy little songs. They seem more serious, better balanced, more sober and better restrained then Yank G.I.'s. War to us is still a great adventure, still something new and extraordinary. Our emotions in the field change from childlike enthusiasm to outraged fury. But soldering, to the children of a far-flung Empire they are called to mend quite often, became more or less an inevitable feature in a man's life. Routine business. Ship builders, mechanics, clerks and grocers five or six years ago, the Killers now look rugged, wiry, stubborn and worn and torn in a magnificent way. They speak little, smile mostly with their eyes only and hate and pursue the enemy in a very professional way. Their emotions are galvanized and co-ordinated to one passion and one outlet - and that is fight. Maj. Gen. F. W. Festing, 36th Division leader, takes a party of Chinese and American officers on an inspection tour. 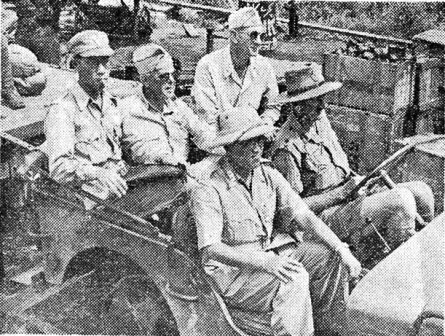 Left to right, in the front seats, Lt. Gen. Liao Yao-hsiang, commanding the Chinese Sixth Army, and Festing. Back seats, Col. Shu, Staff Secretary for Liao; Cols. Smith, Phillips, U.S. liaison. "The bloke who wouldn't open his mouth was 'Dusty' Miller, our greatest joker. It doesn't matter how tough the job is, he always laughs. And this means something, for my men usually are quiet, reserved - but they are fighters. My men don't look it, but they have it. Those blokes they fight like hell, but they clam up like oysters. They are not the bragging kind of blokes who shoot their mouth of . . . and those pansy kind of young blokes are often the best fighters. The bloke over there, Dennis Clark, a private, is a bloody fine fellow. His Bren gun chocked up the biggest amount of Japs in the Arakan. He won the Military Medal, our third highest decoration. There are two other chaps right here who won Military Medals. Davis and Taylor, sergeants. They cleared Sausage Hill in Arakan, the top of the tunnel in which sat the Japs with their heavy guns. We were moving up to the front. Leapfrogging by brigade - one breaks the ground, the other follows - was always one of the main features on the battle order of the 36th Division. Churchill's Butchers (called so by Lord Haw Haw while they took Madagascar) were moving forward to give a rest to the (Arakan) Tunnel Blasters who spearheaded the drive from Hopin to Mawlu. Green, yellow, red scarves of parachute silk gave the marching platoons vagabondism elegance. More so when they stopped now and then for a cup of sweet, milky tea. Officially, they have tea before breakfast, at breakfast, mid-morning, tiffin time, mid-afternoon and supper. But they "brew up" whenever they can. Tea drinking does not interfere with their work, they say, and they do not let anybody interfere with their tea. Coffee excites, the Killers think, but tea gives strength. At a route march test, they told me, one bloke had water, another tea. After the march, the tea drinker was fitter. Incidentally, the Japs, too, are passionate tea lovers. In feudal times, the war lords conducted tea ceremonials in between battles. But where were the Japs? The Killers were itching to fight, but the front seemed Japless. At dusk and at dawn, the 155 mm howitzers within our perimeter yelled into the gaining and fading night and made the earth beneath our tents tremble. No reply. We camped on hilltops, at open tracks, in the skeletons of ex-bashas; they knew too well where we were but they never came. Around Mogaung, they contested every step; thereafter they became elusive. Festing sent patrol after patrol deep into the jungle and into the fields where the elephant grass was tallest. The reports they brought back after 24 or 48 hours' hide and seek with the bowlegged, bucktoothed bastards were meager and inconclusive. "We killed four . . . we killed two . . . we killed seven." This went on for almost a fortnight. Yet the Jap was ahead, behind, and at our flanks. He was hardly seen, but he lay in ambush all about. His invisible name card was on every stretcher of a wounded Tommy ambushed on tracks and roads. These antics did not retard seriously the Division's advance but they were a nuisance. We hardly made a step, even within our perimeters without a rifle, bullet in the barrel. Were these waylayers kidding? Fooling the British to make them believe they have cleared out of North Burma? Festing's Killers knew better. They were always ready for everything and seemed not to care. 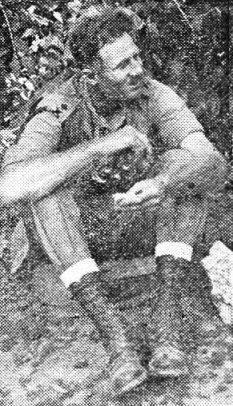 Leader of the 36th Div., Maj. Gen. F. W. Festing, sits along a trail and "enjoys" K rations, or, at any rate, the general appears to be eating them with gusto. At forward headquarters, a blitzed ex-village near a river, life was more casual and carefree than back at Divisional. A 50-strong Jap patrol was roaming the woods back of us, but the picture was a summer holiday camp, minus women. A chiaroscuro of Tommies with bronze torsos and white bellies bathed side by side with olive-skinned Chinese, their cannoneers, and chocolate-brown Indians, their engineers and stretcher bearers. A school of mules would wade in once in a while and join the bath of the soldiers. By sunset, all the Adams with rifles instead of fig leaves would retire into the inner perimeter and prepare for the stand-in. A Welsh regiment had its perimeter on the famous Monastery Hill, where the Chindits held out against overwhelming odds some months ago. 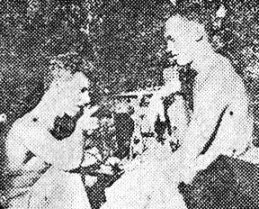 The only intact piece in the destroyed Buddhist monastery was the Abbott's double bed, shared now by two mortar men, Fusilier William Satchwell from Coventry and Fusilier John Hughes from Wales, while their lieutenant slept on a bare plank at their side. Others bunked in the old fox holes and crawl trenches of the Chindits, a fantastic labyrinth under the rubble. Less bitching than among Americans, but they do it, too. Biggest gripe revolves around repatriation, rotation to you. They have to serve five years overseas before they can be repatriated. This has been lowered recently to four. It's still to much, they say. Women: What is she doing right now is a great problem while England virtually is a sea of men. Everybody carries a girl's picture in his wallet and thinks. Said a corporal: "First we had the Free Poles, then the Canadians and now we have you blokes . . . "
The World at Large: Churchill is still everybody's idol, although "he is tactless about repatriation." The general slogan is: Churchill for war - Eden for peace. Most unpopular man: British War Minister Grigg. Reason: Repatriation. Old Teddy, the Duke of Windsor to you, is still popular in the ranks, not so among officers. The same goes for ex-War Minister Leslie Hoare Belisha, who fought the Old School Tie. The Beveridge Plan with its social insurance from babyhood to death is much talked about. U.S. elections were discussed and the men couldn't understand why we should have thought about changing to Dewey. Reason: Roosevelt never let us (them) down. Their jokes are British understatements. They call them "subtle." Try this one: Two hippopotamuses were lying in the water. One of them, closing the left eye, turned to the other and said: "I can't understand why I keep thinking it's Thursday." At last: Contact with the enemy. The Division was clearing a terrain between two villages. Our artillery opened. You had the Killers in action. They were matchless in following up artillery fire. Our rounds were still falling, but the British advanced up to 50 to 100 yards beyond the firing line right up to the burst. There they found the Japs still in their foxholes seeking refuge, rather than the bomb shells. And the Killers stood there in a rain of shells without faltering and shot them right out. Thus, they reaped the benefits of the demolition and saved themselves casualties. And that takes guts. A Yank Air Communications unit serving with the 36th Division sets up a transmitter to report a road block. Left to right, S/Sgt. James Burrows, Cpl. E. J. Morgrain. he stepped out of a bamboo grove to reconnoiter. He tumbled, rose again. And then his gaze met an Englishman with his Tommy gun raised. There was no time to draw a pistol. Sawada had the best idea for the unpleasant moment. He threw his family heirloom to the feet of the Killer to divert his attention. It was too late. He had it, as the British say. The corporal thought Sawada threw a hand grenade, stepped aside. Only then, he realized what he had. Meanwhile, his captain arrived. Said he: "It's your kill, Bramhall. Take what you want." Bramhall's regiment gathered around the sparkling sword with its fancily-decorated handle. A Calcutta sports club just paid Rs. 2,000 for a sword like that when a Killer was there on furlough. Then came an order to march on. The corporal had his tommygun to carry and lots more. The Samurai sword was on sale. But who had Rs. 2,000? Silence. Your correspondent then reached for his wallet, surfaced the savings of past months and, although it was less than Rs. 2,000, the sword of Sawada passed into his ownership. A memory of the Killers. Adapted from the November 30, 1944 issue of CBI Roundup.